1.2.1 Why are there no tropical cyclones at the equator? Currents == vertical movement of air. Winds balance uneven distribution of pressure globally. Winds help in transfer of heat, moisture etc. from one place to another. Sun is the ultimate force that drives winds. Pressure differences force winds to flow from high pressure are to low pressure area. Pressure differences in turn are caused by unequal heating of the earth’s surface by solar radiation. The wind at the surface experiences friction. In addition, rotation of the earth also affects the wind movement. The force exerted by the rotation of the earth is known as the Coriolis force. 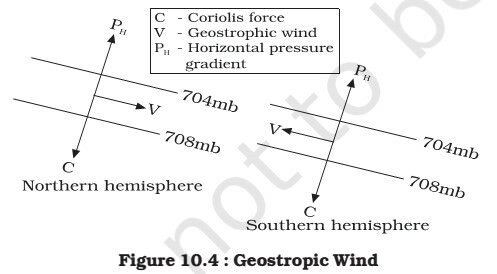 Thus, the horizontal winds near the earth surface respond to the combined effect of three forces – the pressure gradient force, the frictional force and the Coriolis force. In addition, the gravitational force acts downwards. Centripetal acceleration produces a circular pattern of flow around centers of high and low pressure. The differences in atmospheric pressure produces pressure gradient force. The rate of change of pressure with respect to distance is the pressure gradient. Pressure Gradient Force operates from the high pressure area to a low pressure area and causes wind movement. The pressure gradient is strong where the isobars are close to each other and is weak where the isobars are apart. Since a closely spaced gradient implies a steep pressure change, it also indicates a strong wind speed. The wind direction follows the direction of change of pressure, i.e. perpendicular to the isobars. The rotation of the earth about its axis affects the direction of the wind. This force is called the Coriolis force. It has great impact on the direction of wind movement. 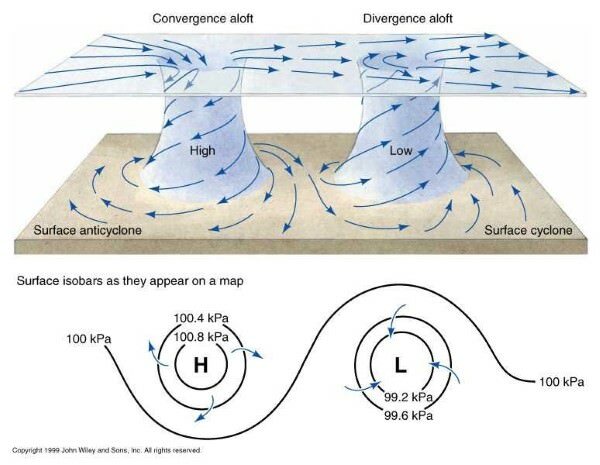 Due to the earth’s rotation, winds do not cross the isobars at right angles as the pressure gradient force directs, but get deflected from their original path. This deviation is the result of the earth’s rotation and is called the Coriolis effect or Coriolis force. 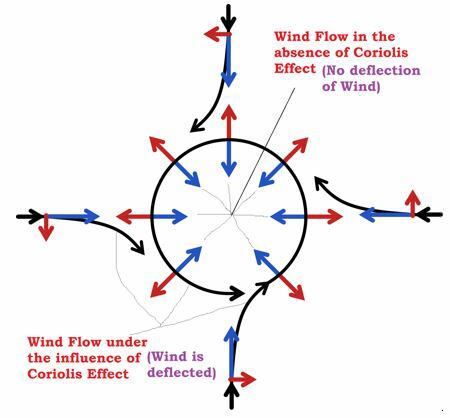 Due to this effect, winds in the northern hemisphere get deflected to the right of their path and those in the southern hemisphere to their left, following Farrell’s Law (the law that wind is deflected to the right in the Northern Hemisphere and to the left in the Southern Hemisphere, derived from the application of the Coriolis effect to air masses). This deflection force does not seem to exist until the air is set in motion and increases with wind velocity, air mass and an increase in latitude. As a result of these two forces operating perpendicular to each other, in the low-pressure areas the wind blows around it (cyclonic conditions). Why are there no tropical cyclones at the equator? The Coriolis force is directly proportional to the angle of latitude. It is maximum at the poles and is absent at the equator. 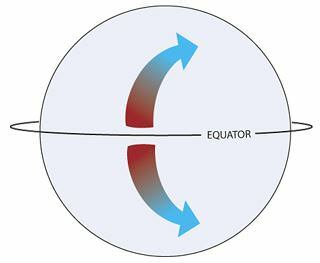 At the equator (Coriolis force is zero) wind blows perpendicular to the isobars. The low pressure gets filled instead of getting intensified i.e., there is no spiraling of air due to zero Coriolis effect. The winds directly gets uplifted vertically to form thunderstorms. The irregularities of the earth’s surface offer resistance to the wind movement in the form of friction. It affects the speed of the wind. It is greatest at the surface and its influence generally extends up to an elevation of 1 – 3 km. Over the sea surface the friction is minimal. Over uneven terrain, however, due to high friction, the wind direction makes high angles with, isobars and the speed gets retarded. It acts only on air that is flowing around centers of circulation. Centripetal acceleration creates a force directed at right angles to the wind movement and inwards towards the centers of rotation (e.g., low and high pressure centers). This force produces a circular pattern of flow around centers of high and low pressure. Centripetal acceleration is more important for circulations smaller than the mid-latitude cyclone. 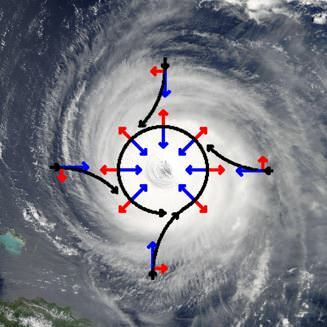 When isobars are straight and when there is no friction, the pressure gradient force is balanced by the Coriolis force and the resultant wind blows parallel to the isobar. This wind is known as the geostrophic wind. The wind movement around a low is called cyclonic circulation. Around a high it is called anti cyclonic circulation. The direction of winds around such systems changes according to their location in different hemispheres. The wind movement or wind circulation at the earth’s surface around low and high on many occasions is closely related to the wind circulation at higher level. Generally, over low pressure area the air will converge and rise. Over high pressure area the air will subside from above and diverge at the surface. The Coriolis effect is the apparent deflection of objects (such as airplanes, wind, missiles, sniper gun bullets and ocean currents) moving in a straight path relative to the earth’s surface. The “apparent” portion of the Coriolis effect’s definition is also important to take into consideration. This means that from the object in the air (i.e. an airplane) the earth can be seen rotating slowly below it. From the earth’s surface that same object appears to curve off of its course. The object is not actually moving off of its course but this just appears to be happening because the earth’s surface is rotating beneath the object. The main cause of the Coriolis effect is the earth’s rotation. As the earth spins in a counter-clockwise direction on its axis anything flying or flowing over a long distance above its surface appears to be deflected. This occurs because as something moves freely above the earth’s surface, the earth is moving east under the object at a faster speed. As latitude increases and the speed of the earth’s rotation decreases, Coriolis effect increases. A plane flying along the equator itself would be able to continue flying on the equator without any apparent deflection. A little to the north or south of the equator, the plane would be deflected. One of the biggest misconceptions associated with the Coriolis effect is that it causes the rotation of water down the drain of a sink or toilet. This is not truly the cause of the water’s movement. The water itself is simply moving too fast down the drain to allow for the Coriolis effect to have any significant impact.